I have always struggled with my weight over the years. Up and down, up and down. It is so frustrating! I know I am not alone. There are thousands of other women who feel the same way. I know sitting in front of a computer for work every day obviously doesn’t help. I am not into snacking. I am not addicted to chocolate. I never buy any type of junk food. So, what is it? To continue a love affair with food to look fabulous with a 10-part plan to making gradual life-long changes in my approach to food. When Beth Aldrich, author of Real Moms Love to Eat, sent me her book to review I couldn’t put it down. It is absolutely phenomenal! It has become such an inspiration to me and a big eye-opener. No, it’s not another dieting book. It’s your go-to source for creative recipes, food facts, friendly advice, and recommendations on opening your mind to learn more about food. It has definitely answered my question above and I believe it will answer any questions you may have. 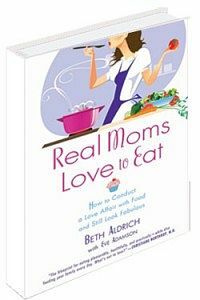 Real Moms Love to Eat is currently available for Pre-Order and will be released in January 2012. Pre-Order your copy today to be entered into the Real Moms Love to Eat giveaway! I was provided with a complimentary product to review. All opinions expressed are honest and my own. I wrote this blog post while participating in the SocialMoms and Beth Aldrich – Real Moms Love to Eat blogging program, for a chance to get 3,000 My SocialMoms Rewards points. For more information on how you can participate, click here. Thank you Beth Aldrich for allowing me to review your book! It is fantastic! This looks like a great book. I am definitely going to check it out. Love getting new information. This sounds like a fun and informative book and I signed up for their newsletter too!